In an exciting new departure for the RSD team, we have been commissioned to undertake a comprehensive review of accommodation standards on board the latest class of Royal naval submarines. Working in partnership with BAE Systems UK, one of the world’s leading defence industry specialists, the project involves studying the requirements for crew accommodation in the highly complex and technically sophisticated interior of a submarine, where space is at a premium and there is no natural light whatsoever – even when the vessel surfaces. 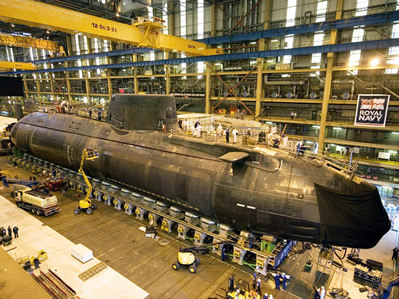 To make the brief even more challenging, the regulations governing submarine interiors are stringent in the extreme (even more so than for aeroplanes) and much of the layout of equipment and technology is classified. The new project involves RSD looking at accommodation requirements in several areas aboard a submarine with a view to improving standards, boosting recruitment and retention, and setting a new benchmark for future builds. Our team has approached this project with the same ethos as when designing the interior of a yacht: maximise the available space and work in harmony with the shape of the vessel – in this case a long tube-like structure. RSD is creating a contemporary, architecturally clean design that promotes well-being and provides plenty of light even in very confined areas. Other critical requirements are that accommodation spaces are easy to maintain and incorporate clever storage solutions so that crew can keep their cabins orderly with the minimum of effort. The design also needs to be robust enough to withstand plenty of wear and tear, sustainable and transferable to other submarine designs. The new interior will provide a more pleasant environment for submariners who don’t see the light of day for weeks on end while they are on a tour of duty and our stylists are committed to designing crew accommodation with the physical and mental well-being of submariners uppermost in our minds, while adhering to the strict limitations on space and safeguarding the confidential nature of other aspects of submarine design.